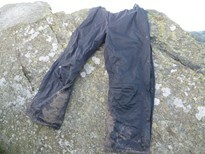 There are few days when you should leave waterproof trousers out of your rucksack. When it's the height of summer, in a drought and no forecast for rain or wind, then maybe leave them at home. Knowing when to put on your waterproof trousers is sometimes difficult, and ideally you should don them just before you need them, but that's easier said than done. Keep looking around when walking, and you can usually see rain on the way. When you put them on also depends on the type of fabric from which your trousers are made, as some dry quicker than others and could this withstand a quick shower. If you’re looking to buy a pair, make sure they aren’t excessively baggy. Baggy overtrousers when soaked have a tendency to fall/ride down, be uncomfortable, constantly need ‘hotching up’ and leading to the potential for tripping over if too long and baggy. Zips need to be almost full length, with emphasis on you being able to get the trousers on over your boots, without having to take them off, and without falling over in the process. If you're out on a windy day, put your waterproof trousers on as they'll prevent the wind penetrating your normal legwear, thus keeping you warmer. Keep your waterproof trousers accessible. Some people store in a rucksack's top pocket, and others in the main compartment. Another option is to stuff them down the front of your rucksack as a means to fill any gaps created by other contents; you still always know where they are when required.